CTV’s exclusive DNA testing revealed four out of 10 fish samples that we purchased and tested were mislabelled, which leads to the question: are consumers being deliberately misled or is something else going on? The McLaughlin on Your Side team bought fish from grocery stores, seafood markets and restaurants and discovered no one is immune to fish mislabelling. Sometimes it's to the detriment of the business, but other times it's to the detriment of the consumer. Red snapper was on the sushi menu at Vancouver’s Bay Sushi, so we ordered it and watched the chef make seven pieces for $14.63. “And that’s red snapper?” asked Ross McLaughlin. “Yep,” replied the Bay Sushi employee. We then went to Sushi Yan, where the menu also had tai snapper on it. Again, we ordered seven pieces for about $15. “Yes,” answered the sushi chef. But Next-Generation DNA sequencing revealed a different story. 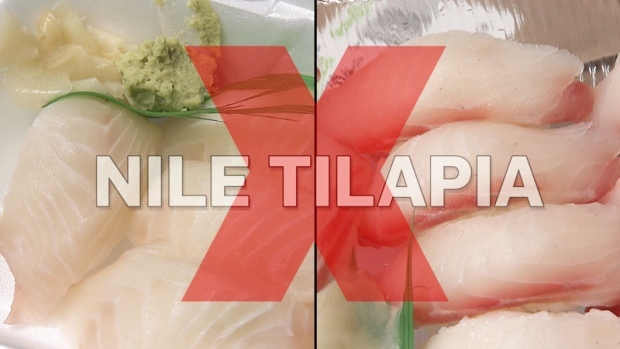 The two sushi samples we bought were actually Nile tilapia, a cheaper fish that is not snapper. Scroll down or or click here to view detailed DNA testing results. When we went back to one of the restaurants, Sushi Yan, an employee showed us a package of tilapia, also called izumi-dai or izumidai. “Every Japanese restaurant, they call this snapper, maybe this name,” she said. “This is tilapia,” explained McLaughlin. “Maybe it’s called in the Japanese they say tai,” she replied. The restaurant believed it was Japanese snapper and when we first ordered snapper, they didn’t try to hide it. When we asked to see the snapper, the chef held up a package of izumi-dai. “That’s not snapper. That’s tilapia,” said McLaughlin while he was ordering the sushi. “Same, same,” replied the sushi chef. “It’s not the same,” said McLaughlin. Then the chef moved off to the side and picked up another slab of fish – this time holding a raw fillet of fish not in a package. “That is tai,” said the chef. “That’s snapper?” questioned McLaughlin. And the chef nodded in agreement. Our test revealed it was tilapia. “They’re not the same fish,” said Kent Oostra, owner of Exact Scientific Services, the lab which did the DNA testing for CTV. “Our labelling laws do not allow tilapia to be called snapper,” explained Julia Levin with non-profit advocacy group Oceana Canada. "And depending on where tilapia comes from, some of the places where it's farmed use chemicals and contaminants that most Canadian consumers would not want to be eating without their knowledge." 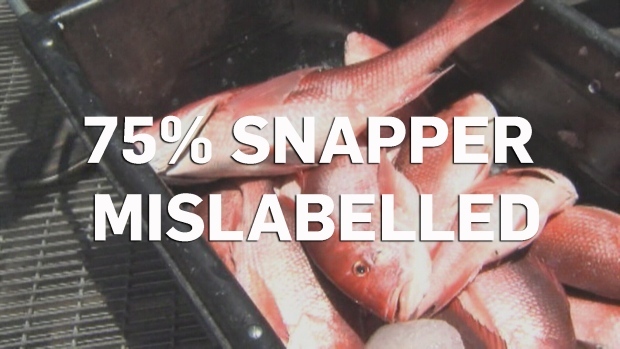 An Oceana study found 75 per cent of snapper was substituted with fish not even from the snapper family and in sushi restaurants it was most often tilapia. And what was even more puzzling, even though the two different sushi restaurants had served tilapia, they each looked like different fish. The one that said tai snapper on the menu was white and pale while the other that was called red snapper on the menu had a reddish appearance. A fish supplier told us some Asian processors will use something called tasteless smoke to get a reddish hue on the otherwise white tilapia. The owner of Bay Sushi, the restaurant where we purchased so-called red snapper, showed us the receipt from his supplier revealing he had ordered izumi-dai telling us that it was tai or red snapper, but it was not. As we learned from both restaurants, there is confusion over the name and what is appropriate. The Canadian Food Inspection Agency is in charge of rules regarding fish labelling. The deputy chief of food safety Aline Dimitri told CTV News that restaurants are under provincial jurisdiction. 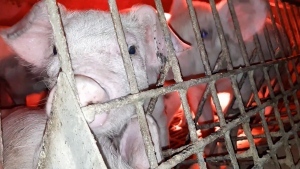 However, if a prevalent mislabelling problem presents itself within the restaurant industry, federal regulators would step in to work with the province in addressing the situation. "You mean the menu has to change the name?" asked the Sushi Yan employee. "The menu has to call it tilapia,” answered McLaughlin. A fish supplier also told CTV that many sushi chefs in Vancouver are in the dark and may have been led to believe it's actually OK to call izumi-dai, either tai snapper or tai red snapper on a menu. But whether or not it's intentional, according to Canada's fish labelling rules, it's wrong. CFIA says education is key in making sure retailers and consumers understand what the labelling requirements, but it appears more work needs to be done.